Call me crazy and I'll understand because this is my third Celine Belt Bag! I started off with the Mini Belt Bag and then downsized to the Micro Belt Bag (reviewed here). And this year I've downsized to the Nano Belt Bag. I really just love this bag's functionality with a top handle and a long shoulder strap. And with each smaller iteration Celine comes out with, the more I love it! I used the Micro Belt bag for over a year now and as much as I love it, the Micro size is just a tad too large (lol when is a micro anything too big?). It's too big to wear crossbody and the bag ends up getting weighed down by all the extra stuff I leave in there when I only really need the essentials. Also the larger size means more leather and thus is also heavier than the Nano from the get-go. They've also made some improvements to the Nano that's won me over. First of all, the long strap is now adjustable so I can adjust it either to wear as a cross body or over the shoulder. The Micro Belt Bag strap isn't adjustable and I've found that it's too long for me to wear it over the shoulder (thus I replaced it with a YSL cloth strap when I was using the bag). Also the Nano version doesn't have the back outside zip which I found nonfunctional in the Micro bag anyway. Also there are no pockets or compartments inside the Nano bag, which doesn't bother me but some might miss that. But it also keeps the Nano bag extra lightweight! But my favorite new improvement is the easy magnetic round clasp that's found on the Nano instead of the fussy and hard-to-use clip that the Micro has. Now it's so much easier for me to close the flap, though I still mainly use the zipper as a way to close the bag. But of course the biggest difference is the size. The Nano is 8 X 8 X 4 IN (20 X 20 X 10 CM) while the Micro is 9 X 8 X 5 IN (24 X 20 X 13 CM). So what can the Nano fit? Well for me it fits all my essentials with some room to spare. I usually only carry my wallet, coin purse, sunglasses, keys (which are made extra bulky with my Airpods attached to them), my sunscreen hand lotion and some lip balms. I can also fit a couple baggus in there as well. Since the base is fairly wide, there's a lot of stuff that can fit in there! So for me, the Nano bag works perfectly. If you're one to carry a bit more than I would probably advise going with the Micro Belt bag. But since I prioritize weight, I like that the Nano is so much lighter than the Micro. 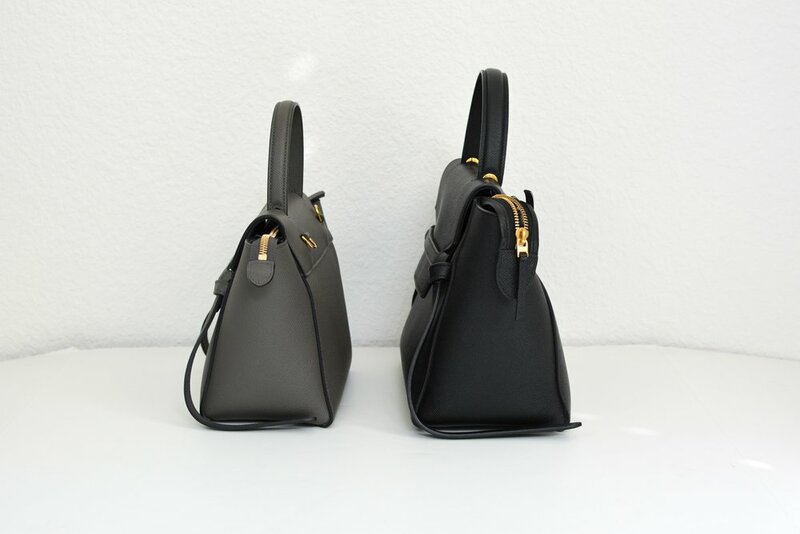 Sometime you can find a used Celine Nano belt bag from my favorite consignment bag shop Fashionphile here. Or if you're looking for the Micro Belt Bag, they usually have more of a selection here. You can also sometimes find the Nano on The RealReal here or the Micro here. And as usual, I'm welcome to any questions you might have about Celine's Belt bags. Just drop a line below! 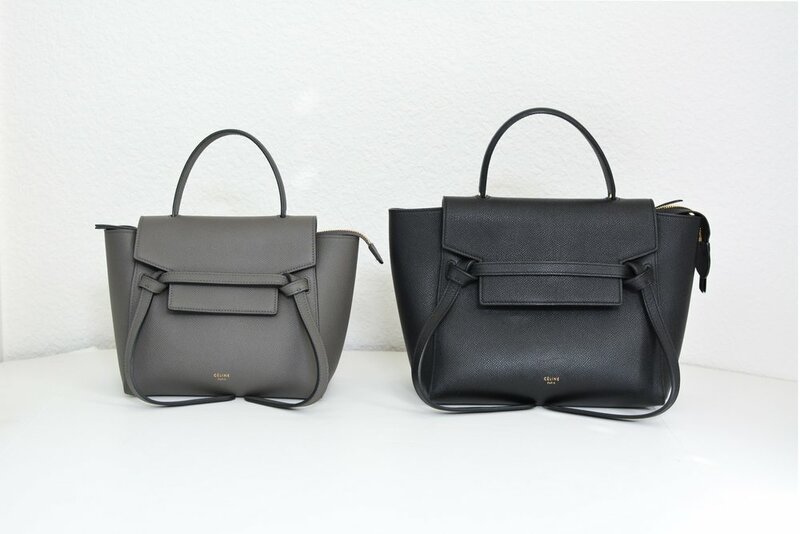 And you can find all my other bag reviews (including all my Celine bag reviews) here. Jan Update: Also here’s a quick comparison pic of all the different sizes taken from Fashionphile. It goes left to right: Nano, Micro, Mini, and the Small.